August 26, 2013 - Cessna’s newest civil aviation aircraft the 182 Turbo Skylane JT-A, N9008H, which is in development and classified as “experimental” by the FAA, had to make an emergency landing after departing from the company’s facility at Independence Municipal Airport (KIDP) on Wednesday. 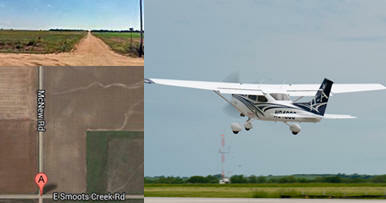 The Skylane JT-A, manufactured in 2011, had departed from KIDP to perform a normal test flight as part of the certification process when it developed engine problems over the city of Pretty Prairie in Reno County, Kansas just west of Cheney Reservoir. The aircraft landed on the intersection of East Smoots Creak Road and McNew Road. The aircraft came to rest in an open field. The test pilot who was the sole occupant onboard was unhurt and the aircraft received no damages. The pilot had reported about 5:30 PM to air traffic control that his engine had blown and needed to make an emergency landing. The diesel engine, SMA SR305-230 was manufactured by a French company, SOCIETE MA a subsidiary of Safran. The SMA SR305-230 is a 230 horsepower air/oil-cooled, horizontally opposed, four-cylinder, four-stroke, diesel piston aircraft engine. Back on May 22, 2013, the diesel powered 182 Turbo Skylane JT-A made its first production flight and since that time the aircraft has flown a number of hours without incident. This aircraft has the distinction of being the first modern single engine aircraft powered by a piston engine specifically designed to run on Jet-A fuel. The JT-A is expected to burn approximately 30 to 40 percent less fuel than comparable avgas engines with a fuel capacity of 87 useful gallons. The aircraft fuel consumption at cruise speed will be about 11 gallons an hour. With a low power setting, the aircraft will fly aloft about 14 to 16 hours. The aircraft will have a seating capacity for four with an estimated useful load of 1,018 pounds and an estimated range at max cruise speed of 1,025 nautical miles with a certified ceiling 20,000 feet. The JT-A will also be equipped with Garmin’s G1000 avionics suite.